Qin, Ping and Xiaolan Chen. 2017. “Chinese Local Residents’ Attitudes toward Shale Gas Exploitation: The Role of Energy Poverty, Environmental Awareness, and Benefit and Risk Perceptions.” EfD Discussion Paper Series 17-18. 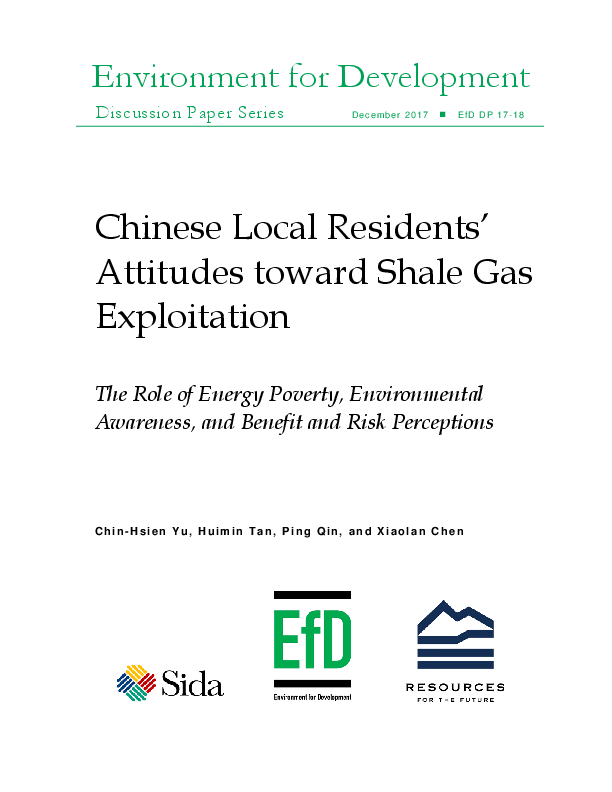 This study investigates Chinese local residents’ attitudes toward shale gas exploitation through an interview of 730 local residents in two counties of Sichuan Province (Weiyuan County and Gong County) and explores the determinants of their support or opposition. It is the first study in China to explore local residents’ attitudes, and we comprehensively identify underlying factors accounting for such attitudes, including energy poverty, environmental awareness, and risk and benefit perceptions. The results show that the respondents are generally supportive of toward shale gas development, no matter whether the shale well is built in their hometown or at a distance. About 70% of the respondents express support or strong support for shale gas exploitation, and less than 20% of them oppose or strongly oppose such development. The results also show that the respondents are more likely to oppose shale gas exploitation if they perceive lower benefits or higher risks associated with shale development, if they are more environmentally aware, or if they suffer from a higher degree of energy poverty.